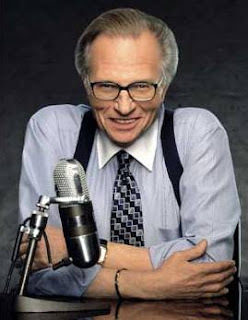 CNN Observations: Can Larry King Still Compete? Continuing the ever-growing list of articles about CNN's numbers during primetime, Brian Stelter examines CNN's struggles during the 9pm hour, and the network's apparent lack of a succession plan for Larry King. "CNN executives will not say whether they will renew Mr. King’s contract when it ends next year. There is a growing feeling at the company that a succession plan should be put in place, but there is no evidence that CNN is actually preparing such a plan. Mr. King was noticeably absent during a presentation for advertisers last month, which heavily featured CNN stars like Anderson Cooper and Soledad O’Brien, but only fleetingly included Mr. King in a video clip. “Larry King Live” is the last trace of an earlier age of cable TV, one that had little interest in the opinions of its hosts. “They have this iconic personality who is going to disappear in the not-too-distant future, and they don’t have any clue what they’re going to do,” one senior employee said, speaking on the condition of anonymity because he did not have permission from the channel to speak publicly." We checked "Showing Up for Life".